Love the perks of shopping online! Imagine effortlessly hopping from one store to the next anytime you want, anywhere you want to be... even while wearing your tsinelas! More than a year ago, because of work, I was relocated to Mindanao. Into a province that's far from the hustle bustle of city life and outrageous Manila traffic. Apparently, it's also far from the biggest shopping malls. And when you have no big malls around you, chances are, your shopping choices are limited. Given the situation, I was left with my next reliable shopping solution - Online Shopping. Back in June, BPI introduced me to SHOPBACK. 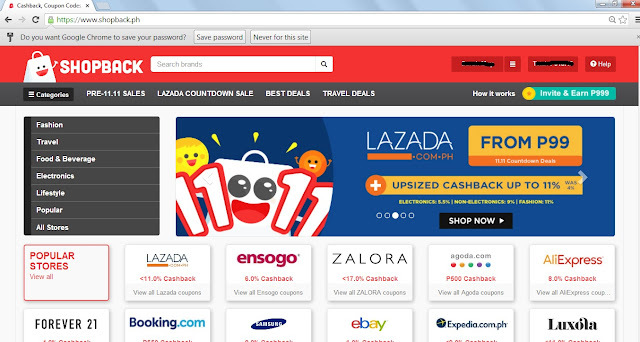 The website has already been featured in PhilStar, Manila Times and Inquirer. It's basically a site that refers you to some of the biggest and most trusted online stores here in the Philippines and abroad. Simply put, you shop online and earn a cashback.